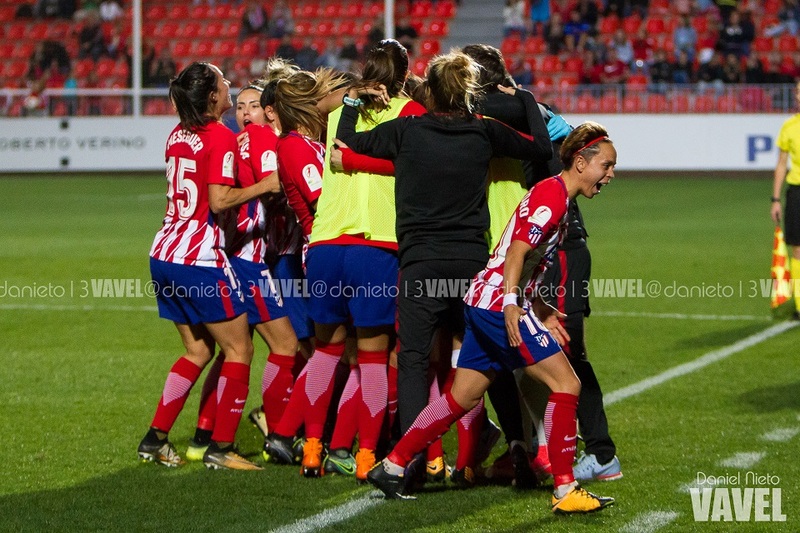 Needing just four minutes to get their noses ahead in the tie, Atlético Madrid put on a masterclass at the CFA to knock Manchester City out of the UEFA Women's Champions League. In what can be reasonably referred to as a fast start, Atleti took the lead in the fourth minute, getting a vital away goal to cancel out City’s from the first leg. Scything through the midfield with a scant handful of passes, Silvia Meseguer capped off the move, driving Ludmila’s square ball into the waiting net. The defending from the hosts abysmal and compounded by having two players go down injured in the ensuring minutes. The drama refused to stop in Manchester as both sets of backroom staff got into a heated discussion on the touchline as the hosts frantically tried to get Steph Houghton back onto the pitch. Attempting a trademark thwack from range, Georgia Stanway drew a superb fingertip save from Lola to keep City searching for a route back into the tie. Having only gone downhill from the team that won the WSL in 2016, City looked decidedly off of the pace, unable to find a way to control the ball or the match. Not the better team in any of the thirds, the hosts struggled to move the ball between each other, Atleti with the style to attack and get results. The tie put out of reach in first half stoppage time, having only been given a warning by Angela Sosa seconds before, when the attacker’s attempted curler slipped the wrong side of the far post, Ludmila made certain. Bursting down the right, the Brazilian shrugged off the challenge of Jill Scott before holding Houghton off and slotting a low shot inside of Karen Bardsley’s near post. Looking slightly livelier after the break, City tried to get going in attack, with just 45 minutes to get three goals and prevent their opposition from scoring again. Nick Cushing’s bench called upon three times in the first 15 minutes of the half, once enforced through an injury to Lauren Hemp, the other two changes clearly searching for inspiration. A slipped ball from Nikita Parris could have seen the hosts reduce the deficit, but a lack of understanding between herself and Nadia Nadim left the ball trickling into Lola’s arms. The tempo fast going out of the side again, the team sub-par and fading fast. The idea of too many games in a short space of a time, a possible explanation for the dogged performance but still just an excuse. The poor football not necessarily a symptom of the fatigue but a simultaneous issue. The hosts given a let off when Bardsley tipped Jenni Hermoso’s driven free kick over before Lola was again called upon to deny Stanway with another spike from range. Even getting blue shirts forward, the hosts continued to look largely outnumbered in the attacking third, unable to part the red sea of Atleti players. With time fast running out for the hosts, Atleti were content to sit back and let the Citizens try to find a way through, frequently with no avail. A conciliation in the last seven minutes ruled out as Parris was flagged for offside, obstructing Lola’s view as she failed to stop Jennifer Beattie’s header. With Parris having already cracked a shot off of the bar earlier in the half, substitute Caroline Weir left the woodwork shaking in stoppage time, her effort from range enough to beat Lola by not the frame of the goal. Already into the meaty eight minutes of stoppage time, the Citizens persevered, looking for something positive to take from the dismal match, a goal; a conciliation to take into their match on Sunday. A header from Nadim that crested wide of the target the last hope for the hosts. With Lola in fine form, doing all that was asked of her, the hosts were left frustrated time and again, the odd flash of something no more than a flash, nothing igniting. The Citizens out Europe with a soft whimper rather than a resounding bang.